Unifying communications by replacing separate PCs and telephones with a PC equipped with a headset and some telephony software can sound like a great idea until the first electricity bill for those always-on PCs comes in. Fujitsu hopes to end that bill shock with an always-on multimedia PC for businesses that features a special power-saving mode. The Esprimo X923 all-in-one business PCs Fujitsu revealed at the Cebit show in Hanover include a headset, a handset, a webcam, microphones and speakers for voice and video communications. PCs that go to sleep when not used are great at saving energy -- but problematic if they are also responsible for handling incoming phone and video calls or maintaining instant message conversations. Rather than suspending all functions, as a PC would typically do in sleep mode, the Esprimo X923 goes into low-power active mode (LPAM). In that state, it pauses power-hungry software such as browsers and office productivity suites, but continues to run Microsoft Windows 8.1 Professional, maintaining an active network connection for communications applications. In that mode, it consumes around 5 watts, around 45 percent lower than the 9.1W consumed in standard idle mode, Fujitsu said - and considerably lower than the computer's flat-out maximum of 56W. However, it's not yet close to the 1.6W the device consumes in true sleep mode. The X923 has a 23-inch Full-HD screen and can be ordered with Intel Core i3, i5 or i7 processors; up to 16GB of RAM; Windows 7 or Windows 8.1, and either a hard disk drive up to 1TB in capacity or a solid-state drive up to 500GB. It has gigabit Ethernet, six USB ports, and a presence sensor that can indicate to compatible applications whether the user really is away from the keyboard. The headset has a "busy" light to indicate to nearby colleagues when the wearer is on a call. The X923-T variant has a touch screen but will not initially include the multimedia module with handset or headset. Fujitsu said the machines are available across Europe immediately, with the price varying by country, although a search of the company's German or French online stores on Sunday only revealed extended warranty packs for the devices, and not the computers themselves. 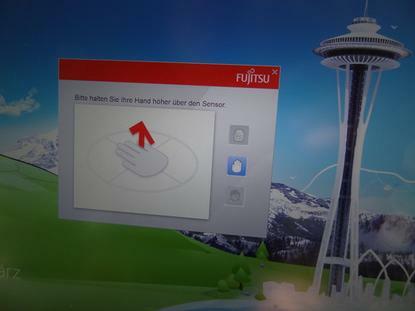 At Cebit Fujitsu is also showing its first ultrabook with palm-vein authentication, a Lifebook U904. The PalmSecure palm-vein authentication module already put in an appearance on the company's stand at Cebit last year. The sensor will reject an authorized user around one time in ten thousand, and allow an unauthorized user one time in 1.25 million, making it 100 times more secure than a fingerprint sensor, the company said. The Lifebook U904 weighs 1.39 kilograms and has a 14-inch, 3200-by-1800 pixel display, with a touch-sensitive option available. Options include Intel Core vPro, i5 or i7 processors running at up to 3.3GHz; up to 10GB of RAM (2GB soldered on the main board, and one DIMM slot for up to 8GB); a hybrid 500GB hard disk or a 512GB solid-state drive, and an LTE module to connect to 4G mobile networks. This machine, without the PalmSecure module, is already in Fujitsu's German online store priced between €1470 and €1900 including value-added tax, depending on the model. A Fujitsu representative demonstrating the palm-vein authentication at the company's news conference estimated the sensor would add €100 to €150 to the cost of the laptop. Cebit runs through Friday at the fairgrounds in Hanover, Germany.